The most famous ‘victim’ of the three clubs in a season rule was arguably Hatem Ben Arfa, certainly in relation to Newcastle United. Loaned out to Hull in the first half of the 2014/15 season, when he was ditched by Steve Bruce, the French winger found himself banned from football for the second half of the campaign. The rules say you can’t play for three different clubs in a season and rather harshly, playing for Newcastle reserves was deemed as qualifying for that, despite Hatem Ben Arfa appealing against the decision. He had a move to Nice lined up but that then had to be postponed as he kicked his heels for over six months. 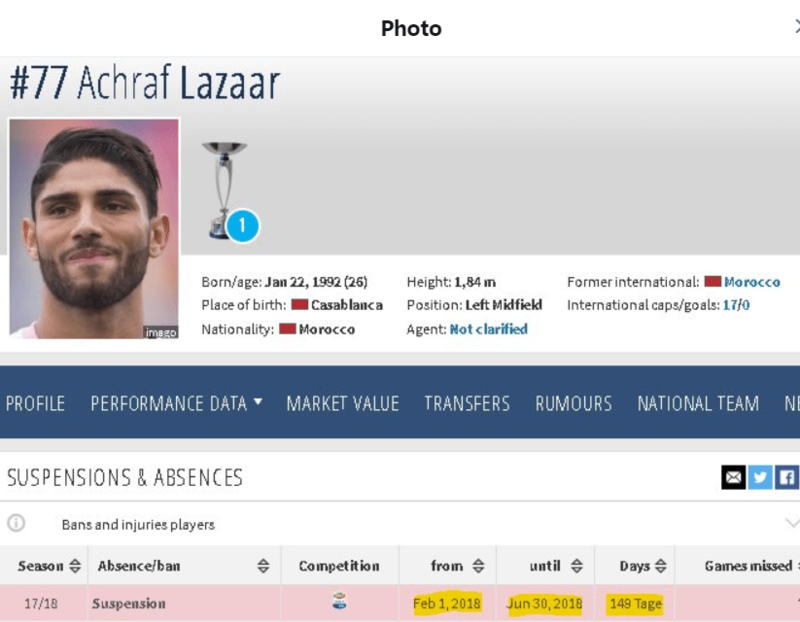 Not sure exactly what level of club would be lining up for Achraf Lazaar after being deemed of no use to the club that is rock bottom of Serie A and certainties for relegation – but nevertheless the Newcastle loan player finds himself in the same position as Hatem. Neither club had commented about the fact but yesterday on The Mag it was revealed (see below) that Achraf Lazaar had not been named in the official Benevento squad after the January transfer window, meaning he couldn’t now play the left-sided player even if they wanted to. Shortly before his August departure on loan, Lazaar played 62 minutes in the 3-2 League Cup defeat to Nottingham Forest. Having made six Serie A starts and three sub appearances for Benevento, once they decided he wasn’t a part of their second half of the season plans, it condemned Achraf Lazaar to no further football this season. It is a little bit like the Tim Krul situation the season before, in terms of being unwanted by a loan club. In 2016/17 Ajax took Krul on a year’s loan from Newcastle but didn’t give him a single minute of first team football and made clear that wasn’t going to change after January. Unlike Lazaar though, Tim Krul hadn’t played for Newcastle in 2016/17 (whether his reserve football for Ajax would have counted if he had done, is an unknown) and so a deal was done whereby Krul moved to AZ Alkmaar for the second half of that season, meaning Ajax were no longer paying his wages and the keeper could get regular football. With three years left on his contract and Rafa Benitez deeming him not even good enough to start in the Championship, it is difficult to see Newcastle being able to shift Achraf Lazaar, unless they basically give him away, as they did with Emmanuel Riviere to get the ‘striker’ off the wage bill. Newcastle United have never before had so many loan deals in a season. A whole host of players heading into and out of St James Park. Loan deals are always/usually seen as a second best option, either a player who is always going to be just at a club for a temporary spell, or others who are on ore of a try before you buy. One outgoing deal in the summer was Achraf Lazaar. The (now) 26 year old Moroccan international proved to be easily Rafa Benitez’ worst signing of Summer 2016. Arriving from Serie A side Palermo, the left-back only played 36 minutes of Championship football as the United boss clearly didn’t feel he was up to even the second tier of English football. No surprise then that Achraf Lazaar headed back to Serie A last Summer, joining promoted Benevento. The Italian media saying that the one year loan deal gave Benevento the option of buying the player for £3m if he impressed. Achraf Lazaar featured in nine Serie A games up to 19 November, six as a starter and three as a sub, Benevento lost all nine games. The Newcastle loan player then disappearing from the first team scene with vague claims of an injury. The final days of the January transfer window saw Lazaar reappear but only as an unused sub twice. January saw Benevento very busy in the transfer market as they desperately try to get out of relegation trouble, with 13 games remaining they are currently on only 10 points still, six behind even the second bottom team Hellas Verona (where Rolando Aarons is on loan). Amongst the players they brought in were former Premier League players Sandro and Bacary Sagna. As for Achraf Lazaar, it all gets a little strange. As somebody who will be easily one of their biggest wage earners this season, very strange they aren’t even having him amongst the substitutes. As you can see, it says he has a 149 days ‘suspension’, from 1 February 2018 to 30 June 2018, which coincidentally is when his loan spell ends from Newcastle. Just like Premier League clubs, those in Serie A have to name a squad of senior players at the end of both the Summer and January transfer windows, these are the only players (as well as those classed as Under 21) who can then be used in league matches. Achraf Lazaar was of course named at the start of September in the Benevento official Serie A squad. However, when the Italian club posted their updated squad on 3 February, it appears that Achraf Lazaar was missing. No official confirmation from either Newcastle United or Benevento and certainly no claims of any injury happening between him being named as a sub on 28 January and the new squad being announced, but looking at it, it appears as though the players brought in during January have left no room for Achraf Lazaar to be included for the rest of the season. Whatever the truth, it looks like I have more chance of winning the Euro Millions than there is of Benevento buying Achraf Lazaar at the end of the season.